We now understand and we see the behavior in Notepad++. But we don’t know other programs that do this. We will research into if it can be implemented. We already have this request in our wishlist, the priority for it is not decided though. Can you please elaborate with a simple test case and what are you trying to achieve using the keyboard shortcut? Please contact our Sales team at sales@webyog.com and they would help you. The Wine webpage explains how to upgrade Wine https://wiki.winehq.org/Ubuntu. Current stable Wine version is 3.0 and development version is 3.6. But Ubuntu have always been behind as regards WIne as compared to other major distros (Fedora, OpenSuSE, etc.). .. in 5.5 InnoDB row_format default is ‘compact’ – in 5.7 it seems to be ‘dynamic’ (though I don’t see it clearly documented. However all my 5.7 InnoDB tables use ‘dynamic. even though I never specified it globally nor at table-level). .. so this is a real difference on how the table are created and data stored on the two servers (you probably never specified this and servers applied different defaults). We just did not consider this parameter before (but we should have done, really). .. and to see this setting for tables in a specific database execute “SHOW TABLE STATUS FROM database_name;”. 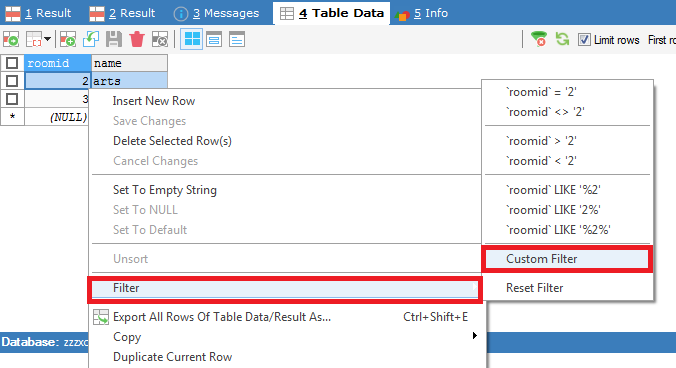 Also note, that in the SQLyog CREATE/ALTER TABLE GUI we have (in the ‘advanced’ tab) an option to specify the ROW_FORMAT. We have added the feature request to our tracker, here, but the priority is yet to be assigned. 1) Currently, there’ no option to add %% around the text, you need to manually type %% around the search text. 2) The “Filter” icon in the Result window refreshes the existing filter and provides an option to create a new filter. 3) We have added the feature request to our tracker, here, but the priority is yet to be assigned. We can reproduce it with Windows as well. Hence it’s not a wine-related issue. I have added this issue to our issue tracker, here >> https://github.com/webyog/sqlyog-community/issues/2163, but the priority is not assigned yet. Can you please elaborate more. Please tell have you migrated Monyog from Windows to Debian? Also, tell exactly what happened that should have not, and what does not happen that should? Ensure the MONyog service is stopped on the old machine before taking the backup of the files and also stop the Monyog service in the new machine before importing the backup to avoid conflicts/inconsistency between the files. No. This option is not available. Just to get it clarified, have you created the new jobs in SQLyog? Also, tell the OS of the new computer. Also, you mentioned “I set up one previously which has been working fine.“. Was this job created in SQLyog or Windows task scheduler? We have replied to the ticket that you created.